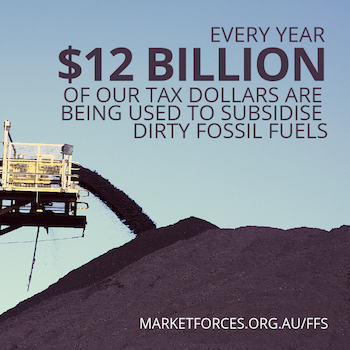 National tax-based subsidies that encourage fossil fuel production and consumption add up to a whopping $12 billion every year. This is Australian taxpayers’ money subsidising an already filthy rich fossil fuel business. Rather than tackling climate change and record levels of air pollution, instead our politicians choose to dole out billions to a dirty and dying industry – one that also bears few costs for its devastating impacts on our health and environment. Using estimates from the Australian federal government’s Tax Benchmarks and Variations Statement (TBVS) and Treasury papers, the table below lists measures within the national tax system that encourage the production and use of fossil fuels. The fossil fuel industry’s enjoyment of such benefits is an amazing feat, with many companies “donating” hefty sums to Australia’s main political parties. These figures are only ever going to be a low estimate. Fossil fuel subsidies can be difficult to find in the tax system and it’s likely some have been overlooked. These figures do not include state-level subsidies, direct government handouts to coal, oil and gas projects, or public financing of international projects through export credit agencies or international financial institutions. 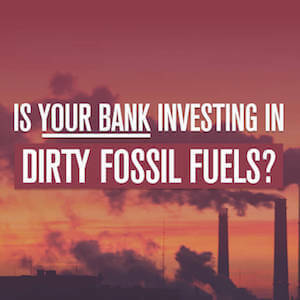 Take action - tell Treasurer Josh Frydenberg: End polluter handouts! ^ This is not an official figure. Values for this subsidy are not available for 2019-20 onwards and we have therefore assumed it is equal to the most recently reported value. * Values represent the middle value of a range estimated by Treasury. i.e. 5 is reflective of a Treasury estimate of 0-10, 55 reflective of a Treasury estimate of 10-100. ** Values taken from Australian Government Budget Paper No. 1 2018-2019 Paper 1. and Australian Government 2017-18, Budget Paper 1. *** Three latest figures taken from Budget 2015-16 Mid-Year Economic and Fiscal Outlook (MYEFO) – Tax Expenditures. Item removed in subsequent MYEFOs. All other measures and their corresponding values are estimates taken from the Australian government Treasury’s Tax Benchmarks and Variations Statement 2018 published 29 January 2019. By far the biggest contributor to the tax-based subsidies total is the Fuel Tax Credit Scheme, which provides around $6 billion worth of credits and grants to cover the excise tax paid on petrol and diesel to reduce its costs to heavy users. It’s estimated that some 20% of these fuel tax credits go directly to fossil fuel producers. We have included the full amount as it all goes to supporting fossil fuel consumption. There are also a range of tax incentives for fossil fuel exploration and production, as well as measures encouraging aviation, shipping and motor vehicle use. Tax and other financial assistance to victims of natural disasters — those on the front lines of the extreme weather resulting from climate change — shows the federal government is fully aware of the increasingly devastating impacts of such disasters. Yet in recent years it has slashed $500 million from The Australian Renewable Energy Agency (ARENA) and reduced the Renewable Energy Target (RET) by 20%. Certain government members also continue to call for more cuts to renewables. In an environment of falling corporate tax rates, tax-based fossil fuel subsidies leave us less able to fund the renewable energy and broader economic transition Australia so desperately needs to align itself with the goal of limiting global warming to below 1.5°C. Without such subsidies, perhaps we could afford more of the projects required for Australia to achieve zero emissions within 10 years. A Market Forces campaign in early 2013 raised $2,000 to cover the costs of Freedom of Information requests to the government. We asked which industries were pocketing our taxes through these subsidies, who was lobbying the government to keep their handouts in place and how we could start cancelling fossil fuel subsidies. The documents revealed that the government had been under pressure from the mining industry who were worried about their $2 billion per year fuel discount (paid for by the Australian taxpayer) and that the government was considering options to scale back polluter handouts. Check out the documents here. A survey commissioned by Market Forces in January 2013 showed overwhelming opposition to fossil fuel subsidies. Three times as many people believe that fossil fuel subsidies in Australia are too high than those who thought they were too low, and 64% of Australians disapprove of the mining industry receiving a discount on their fuels such as petrol and diesel – a measure that costs the taxpayers $2 billion per year. View the results of the polling in full. Expenditure on fossil fuel subsidies dwarfs the government’s feeble spending on its Direct Action plan to tackle climate change. In fact, yearly spending on polluter handouts were almost equal to the total $2.55 billion that the Abbott government committed to the Direct Action plan. This is an enormous policy conflict and amounts to billions of dollars wasted on policies that cancel out each other’s objectives. Subsidies represent a distortion of the market, which makes sense if we need to stimulate an industry or sector for our collective good. Instead, fossil fuel subsidies often end up in the hands of wealthy mining or prospecting companies. For instance, $2 billion each year is handed out to the mining industry in the form of fuel tax credits – essentially a discount on their petrol and diesel. In 2009, Australia joined an agreement at the G20 in Pittsburgh to phase out inefficient fossil fuel subsidies in the medium term. Since then, Australia has tried to play down its commitment, dodging the issue by claiming we have no subsidies falling within the scope of the G20 commitment. The Treasury disagreed, identifying 17 measures worth $8 billion that would need to be cut for Australia to meet the G20 agreement. In his 2011 climate change review update, Professor Ross Garnaut also listed the elimination of fossil fuel subsidies as a key measure for reducing carbon pollution.